Fermium was found in 1953 in fallout from the first hydrogen bomb by a team lead by Ghiorso. 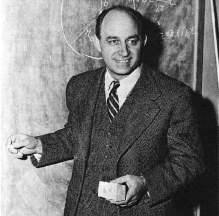 Fermium (Fm) was named in honor of Enrico Fermi (1901-1954). Born and raised in Rome, Fermi studied at the University of Rome, and received a doctorate from the University of Pisa. His work on nuclear reactions and the formulation of the neutrino to explain missing energy in beta decay eventually lead to a Nobel prize in physics. Fermi suggested that neutrons should be particularly useful for creating heavier isotopes. When his students noted that wooden lab tables increased the ability of neutrons to induce artificial radioactivity, Fermi proposed that only slowed neutrons were absorbed to create heavier atoms. This led Fermi's team, Marie Curie's team in Paris, and the team of Lise Meitner, Fritz Strassmann, and Otto Hahn in Germany to attempt production of an element heavier than Uranium. Meitner, escaped to Denmark the night before her scheduled arrest for Jewish ancestry. When Strassmann informed Meitner by mail that their product was chemically identical to Barium, she and her nephew, Otto Frisch, proposed fission. It was immediately apparent that fission was exothermic and might fuel a bomb. In 1938 Fermi was called to Sweden to accept the Nobel Prize. The Fermi family used the opportunity to escape Italian persecution (Fermi's wife was Jewish) by emigrating to the U.S.A. In New York and later working in a squash court inside the West Stands at Stagg Field, University of Chicago, Fermi led the effort to sustain a controlled chain reaction with neutrons slowed in a graphite pile. Arthur Compton telephoned James Conant of success saying, The Italian navigator has just landed in the new world. Fermi's team then simultaneously designed a small test reactor for the Clinton Laboratories in Tennessee and the giant nuclear reactors for Hanford, Washington, to produced Plutonium used in the Nagasaki atomic bomb that ended World War II. After the war Fermi pioneered research on high energy particles. Fermi had a reputation for building the least fancy apparatus that could achieve the experimental objective. His penchant for conserving resources extended to his famous estimations. For example, at the New Mexico test of the first atomic bomb, he dropped scraps of paper to measure the resulting wind, then immediately used the wind velocity to estimate the power of the bomb. Read more about Fermi and a colleague, Edward Teller, in a letter to Physics Today.